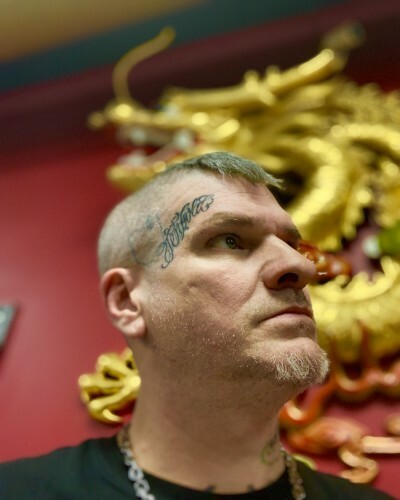 Meet Eugenius Scott Cutlip Jr.
Tattoo Artist I started my tattoo apprenticeship in the late 1990's under the watchful eye of fellow local tattoo artist John Artist. 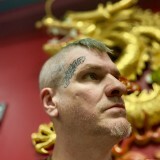 I've worked in over a dozen tattoo shops between Cleveland and Daytona Beach and I have over 15 years of experience in tattooing. . Sketch Artist I've had a pencil in my hand since I was old enough to hold one and I'm rarely seen without a sketch book in my lap. I'm pretty sure there is one in every room of the house as well as the car and front porch. When I was just 15 years old I was hired by Congressman Dennis Kucinich's campaign team to design election posters and advertisements. I can work with all mediums - pen, pencil, paint - and can turn any idea into a masterpiece. Graphic Artist My wife owns a graphic design studio which has given me more of an opportunity to get acquainted with digital design. I've helped develop logos and advertising campaigns for local businesses and non-profit organizations. I have a few years of experience with Adobe Photoshop and Illustrator under my belt; always learning something new. While I still prefer to keep with my sketch book and pencils I do enjoy the extra level of creativity these programs offer.